Port Charlotte is an unincorporated community and census-designated place (CDP) in Charlotte County, Florida, United States. The population was 54,392 at the 2010 census. Port Charlotte was named to Forbes‘ list of “25 Best Places to Retire in 2015”, listed among the ten best places in the United States to retire for the year 2012 by U.S. News & World Report, and was ranked at #1 in CNNMoney.com‘s 2009 list of 25 Best Places to Retire. In the 1950s, the now defunct General Development Corporation led by the Mackle brothers decided to take advantage of the Florida land boom and developed land on both of Florida’s coastlines. Among the areas they planned and developed was the Port Charlotte. Ultimately, Port Charlotte became the most populous community in Charlotte County, although like most GDC developments, Port Charlotte remained an unincorporated community. Port Charlotte is located at the north end of the Charlotte Harbor Estuary, northwest of the city of Punta Gorda. It is 100 miles (160 km) south of Tampa and 65 miles (105 km) north of Naples. According to the United States Census Bureau, the CDP has a total area of 32.3 square miles (83.7 km2), of which 28.4 square miles (73.6 km2) is land and 3.9 square miles (10.1 km2) (12.01%), is water. The area of northwestern Port Charlotte where State Road 776 intersects US 41 is also known as Murdock. Unlike most of Port Charlotte, this part is not residential, and includes the Port Charlotte Town Center and other commercial and light industrial uses. 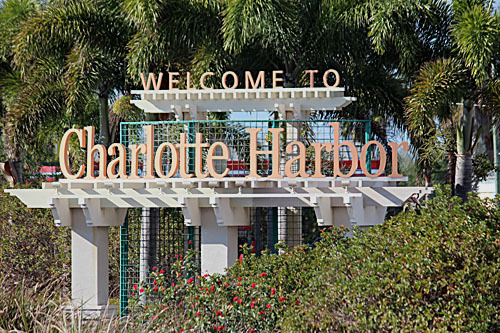 Since Port Charlotte is unincorporated, it is governed by Charlotte County. The county is governed by a 5-person county commission, which rotates into the commission chair position every year. County commissioners frequently sit on other regional boards involving other municipalities and counties. As of the census of 2000, there were 46,451 people, 20,453 households, and 13,601 families residing in the CDP. The population density was 2,085.9/sq mi (805.3/km²). There were 23,315 housing units at an average density of 1,047.0/sq mi (404.2/km²). The racial makeup of the CDP was 89.23% White, 6.53% African American, 0.28% Native American, 1.14% Asian, 0.05% Pacific Islander, 1.18% from other races, and 1.59% from two or more races. Hispanic or Latino of any race were 5.16% of the population. There were 20,453 households out of which 20.8% had children under the age of 18, 53.2% were married couples, 10.1% had a female householder with no husband present, and 33.5% were non-families. 28.2% of all households were made up of individuals and 18.6% had someone living alone who was 65 years of age or older. The average household size was 2.25 and the average family size was 2.71. In the CDP, the age distribution of the population shows 18.7% under the age of 18, 5.4% from 18 to 24, 21.0% from 25 to 44, 24.2% from 45 to 64, and 30.7% who were 65 years of age or older. The median age was 49 years. For every 100 females, there were 87.7 males. For every 100 females age 18 and over, there were 84.2 males. According to Sperling’s Best Places, as of July 2015 the family median income in Port Charlotte was $48,911, and household income was $40,049. The per capita income was $22,681. Port Charlotte’s unemployment rate was 5.50%, compared to 6.30% for the United States overall. 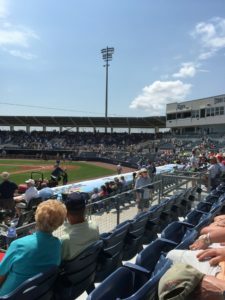 Port Charlotte is the spring training home of the Tampa Bay Rays, and home to the Charlotte Stone Crabs, which is a member of the Florida State League and Class High-A affiliate of the Rays. Both teams play at Charlotte Sports Park. Public schools in Port Charlotte are operated by Charlotte County Public Schools. For the 2007-08 school year, all schools in Port Charlotte received A’s from the Florida Department of Education. Port Charlotte High School is the only public high school located in Port Charlotte, but not the only high school in Charlotte County. Southern Technical College operates a campus in Port Charlotte. The Mid-County Regional Library and the Port Charlotte Library are located in Port Charlotte. They are included in the Charlotte County Library System.